Guest review taken from VRBO on 2/4/19 for Poipu Shores 101B ---The location with the lanai over the water, the pool, the proximity to the beach Is a winning combo Quiet south shore locale with spacious private lanai and fantastic views along the coast - on a good day you can see Nihau. There are turtles in the water just below the lanai, and whales (Jan), dolphins, etc putting on a show plus the heated pool with same great view literally steps away and a short 5 min walk off property to a great beach spot to swim/snorkel. These are the reasons to visit this property. The actual unit was comfortable although interior is dated and could use a facelift. The lack of an oven was minor inconvenience. Cable was glitchy but then you dont come to Kauai to watch tv. The rental car arrangement rounds out the package. This was a return visit to this same unit from our last trip out and we were very happy to be there. We would not hesitate to stay here again. They were completely professional and handled everything. ---MANAGER'S RESPONSE: Mahalo, Michael! Rarely have I had a situation where the property was so perfect. Every last detail was taken care of. The Great Vacation Retreats team were better than almost any travel service company I have ever worked with. ---MANAGER'S RESPONSE: We appreciate it! We hope to work with you, again, in the near future! Always helpful knowledgeable friendly. Its like working with a friend ---MANAGER'S RESPONSE: Mahalo, Nan! We appreciate it! Weve stayed five times with gvr and never been disappointed. You are the best! ---MANAGER'S RESPONSE: We hope to continue the tradition and keep providing you an amazing stay on Kauai! Everything was fine I just found I received quite a few emails regarding the reservation, check in, etc and it actually gets more confusing keeping track of which email is the one with the info I need. ---MANAGER'S RESPONSE: Mahalo for the feedback, Michelle. We will continue to review our CRM's with management and marketing! Issues: 1. 10am check out is far too early especially with a 3pm check in. It should take a max of 2 hours to clean the condo for turn over. 2. We were there for 5 nights but only provided 3 bath towels Suggestions: 1. The bathroom lighting needs updating, it is so dark I couldnt do my makeup. 2. Ice maker in freezer is pretty slow, it would be nice to have some ice trays to make additional ice. 3. A smalll soft sided cooler would be more convenient for short day trips and fitting in the car. The large hard cooler does the trick but is quite large for lugging around. ---MANAGER'S RESPONSE: Mahalo, Michelle, we will share this message with the entire team! We had a hard time reaching individuals by phone. We received texts from multiple people over our concerns. ---MANAGER'S RESPONSE: Mahalo for the feedback, Keri. We will address it, accordingly! FYI- there is no can opener in the property. Also, two rolls of toilet paper for each bathroom is not enough for a 3 week stay. ---MANAGER'S RESPONSE: Mahalo for the feedback, Keri. We will address it, accordingly! Guest review taken from VRBO on 1/31/19 for Kuhio Shores 416 ---Great Sunsets The location is central to all the activities on Kauai and as a bonus it has an unobstructed view of the ocean. There is a small grassy area on the ocean side that is one of the best spots on the island to watch the spectacular sunsets. A nice outdoor shopping mall with many restaurants is a decent walk away and on Wednesdays the mall hosts a market with fresh produce and local vendors. The condo is very comfortable for a couple and all the utensils required to make your own meals are included. Also included are all the beach accessories you will need including umbrella, cooler, and beach chairs. Overall a great stress free vacation spot that should meet all your needs. Guest review taken from VRBO on 1/30/19 for Pili Mai 1L ---Great location and just like the pictures Check-in was smooth and everything was as-stated. Just a short drive from the beach and walking distance to Starbucks and other restaurants. Guest review taken from Google on 1/30/19 for Poipu Shores 101a ---Gorgeous view of the ocean. Watched whales swim across the horizon while sitting on patio. Great location, walking distance to beach and restaurants. Quiet and safe area. Clean, lots of closet space. Lots of towels and utensils. Would definitely recommend it! Really nice people! ---MANAGER'S RESPONSE: Mahalo, Mary! Really nice! ---MANAGER'S RESPONSE: Mahalo, Mary! Guest review taken from Airbnb on 1/27/19 for Kiahuna Plantation 248 ---Went to a wedding at Plantation Gardens and this was a cozy place to stay within walking distance! It was so awesome that the Airbnb provided beach stuff: chairs, snorkels, a boogie board and an umbrella!. Enjoyed walking to the beach and going left past a couple resorts - saw turtles, Hawaiian monk seals, and chickens galore. Great Vacation Retreats was incredibly easy to communicate with via text. The included rental car made my life planning the trip a lot easier. And the coffee and snacks in the Airbnb was another nice touch! Loved eating acai bowls at Little Fish where you pick up the key. Hope to visit Kauai soon and would definitely stay here again, thank you! Guest review taken from Google on 1/26/19 for Poipu Sands 412 ---Fantastic. This apartment had everything we needed and more. Very comfortable, spacious and beautifully decorated, close to beaches, restaurants and shops. Would definitely stay again. Guest review taken from Airbnb on 1/2819 for Kiahuna Plantation 40 ---Great Vacations Retreats are FANTASTIC hosts! The communication was fast, incredibly thorough, and very helpful. The offer to text before and during your stay. We took advantage of that and it was great. The location - Kiahuna Plantation - is AWESOME! The private beach is walking distance, and it's close to restaurants, shopping, and other sites. We stayed in Building 8 and really liked the location. Great Vacations knew that we were coming for my birthday, and unexpectedly a balloon arrangement was awaiting us upon our arrival. VERY nice touch! Check-in was easy, hostless, and painless. Highly recommend!! Guest review taken from Airbnb 1/24/19 for Kuhio Shores 215 ---This property offers a truly incredible view, with a spacious clean unit that is perfect for families and or groups desiring a separate bedroom with twin beds. Also stocked with beach chairs, umbrella, ice chest, etc. with short stroll to the public snorkeling beach! Guest review taken from VRBO on 1/27/19 for Poipu Sands 513 ---Sunrise over the Pacific Everything was "as advertized". Great setting, beautiful views. Well appointed. Everything played like clock work. No issues with management and thats a huge relief. ---MANAGER"S RESPONSE: Mahalo, Lorna! We truly love the grounds at the Kiahuna. Its a pleasure to stay there. Wish we could stay for a month. Do you have a two bedroom on the water? ---MANAGER'S RESPONSE: It would be a pleasure to host you, again! Our Kiahuna condos are all 1 bedroom, but we hope that we find a suitable place for your return! great communication through booking and right up to our actual stay very accurate and timely ---MANAGER'S RESPONSE: Mahalo, William! Great location the unit was close to everything. it was nice that it had no air conditioning but with the screens on windows with shutters inside always had a nice breeze and maintianed a very comfortable temperature ---MANAGER'S RESPONSE: Mahalo, William! We hope you return to kauai, soon! We'll be happy to work with you, again! Guest review then from VRBO on 1/24/19 for Pili May 15J Great condo! What a wonderful condo! Easy access to all of Poipu, Starbucks right down the street, condo had all the necessities and more such as board games, beach gear and cleaning supplies! Kitchen has all the needed cooking supplies. I highly recommend! Very friendly, courteous, and efficient staff. ---MANAGER'S RESPONSE: Mahalo, Bryce! The property is spectacular. Gardens are beautiful. Great for a quiet family get away. ---MANAGER'S RESPONSE: Mahalo, Bryce! Communication was easy, especially the texting option. ---MANAGER'S RESPONSE: Mahalo! Our family thoroughly enjoyed our stay at 810 Regency. The condo was clean, fully stocked, well lit, and in a safe area. Communication with the staff was a breeze. We loved having the ability to walk to Poipu Beach, Brennecke's Beach, and Shipwreck Beach. Poipu is a fantastic location for a vacation on Kauai, as the entire island is easily reached from this location. The rental car that was provided free with this booking was a huge asset and a great deal. We were pleased with the offered vehicle and had an easy transaction with pick-up and drop-off. I commend the staff with their attention to detail in preparing the condo for visiting families. Every time I thought to myself, "I wish we had this..." and took a look around, I would find exactly what I needed. From beach equipment, beach towels, and a cooler, laundry detergent and paper towels, right down to tea, honey, and a travel coffee mug I could use as we drove around the island. The only addition I would have made is to add a collapsible drying rack. Other reviewers have commented on hearing footsteps from upstairs. That is a part of condo living and it did not bother us. We happily recommend staying at 810 Regency. ---MANAGER'S RESPONSE: Mahalo! We appreciate the review and we hope we can assist you on your return visit!! Guest review taken from VRBO on 1/22/19 for Regency 810 Lovely vacation rental with all amenities Our family thoroughly enjoyed our stay at 810 Regency. The condo was clean, fully stocked, well lit, and in a safe area. Communication with the staff was a breeze. We loved having the ability to walk to Poipu Beach, Brennecke's Beach, and Shipwreck Beach. Poipu is a fantastic location for a vacation on Kauai, as the entire island is easily reached from this location. The rental car that was provided free with this booking was a huge asset and a great deal. We were pleased with the offered vehicle and had an easy transaction with pick-up and drop-off. I commend the staff with their attention to detail in preparing the condo for visiting families. Every time I thought to myself, "I wish we had this..." and took a look around, I would find exactly what I needed. From beach equipment, beach towels, and a cooler, laundry detergent and paper towels, right down to tea, honey, and a travel coffee mug I could use as we drove around the island. The only addition I would have made is to add a collapsible drying rack. Other reviewers have commented on hearing footsteps from upstairs. That is a part of condo living and it did not bother us. We happily recommend staying at 810 Regency. Guest review taken from VRBO on 1/22/19 for Kiahuna Plantation 313 Wonderful stay at Kiahuna Plantation 313 The Kiahuna Plantation in general and 313 were wonderful for us. The plantation grounds and gardens are beautiful, the beach was one of the best on the island. Snorkeling, boogie boarding, and swimming just off shore were also wonderful. A nice easy break also was good for learning to surf. We visited places all around Kauai and agreed at the end of our trip that the Kiahuna Plantation was one of the best areas we saw and we plan to stay here again in the future. The rental car that came with 313 was greatly appreciated. Couldn't ask for a better spot! Extremely helpful staff, and a very efficient and easy to use website and booking process. ---MANAGER'S RESPONSE: Mahalo, Stephen! Poipu Sands 122 is a superb property. 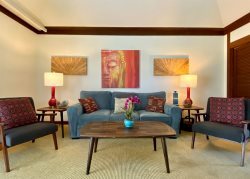 Clean, beautifully maintained and stocked with everything you could possibly need for a great holiday on Kauai. We loved our stay here, and will be back for a longer holiday. ---MANAGER'S RESPONSE: We look forward to working with you, again! Mahalo for choosing GVR! Very easy and friendly ---MANAGER'S RESPONSE: Mahalo, Robert! This is a gorgeous property with everything you could possibly need. ---MANAGER'S RESPONSE: Mahalo, Robert! We look forward to working with you, again!